National Hot Pastrami Sandwich Day is one of the many informal national food holidays observed in the United States. It is celebrated annually on January 14. Pastrami is a delicatessen meat. It was introduced to the USA by Jewish immigrants from Romania and Bessarabia in the late 19th century. Pastrami is usually made from beef, though turkey pastrami is also quite popular. It was originally created as a way of preserving meat. It is made by the raw meat being brined, then partially dried and seasoned with various spices and herbs (for example, cloves, garlic, allspice, mustard seed, coriander, paprika, black pepper). Then the meat is smoked and steamed. A hot pastrami sandwich is a classic New York deli sandwich. Hot pastrami is sliced and served on rye bread. The sandwich can be accompanied by coleslaw (a raw cabbage salad with a vinaigrette dressing) and Russian dressing (a salad dressing made of a blend of ketchup and mayonnaise complemented with pimentos, horseradish, chives and spices). In Los Angeles, pastrami sandwiches are usually accompanied by pickles and yellow mustard. 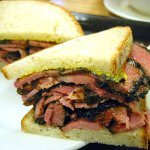 To celebrate National Hot Pastrami Sandwich Day, treat yourself to a delicious pastrami sandwich.